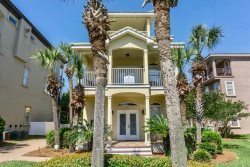 Beauty and the Beach~ Enchanting Beach Retreat With Impressive Amenities One Block From The Beach!!! BOOK YOUR GETAWAY TODAY!!! Beauty and the Beach | Destiny East, Just totally Renovated- New photos coming soon!!! Property Size 3,200 sq. ft.
Destiny East - Great amenities in this gated community near the beach! Destiny East is an exclusive gated community just one block from the beach. Our community amenities include a beautiful Pool, Hot Tub, 2 Tennis courts, Big Playground, Covered outdoor grilling area (with 2 gas grills), Million dollar Clubhouse with Imax Movie theater and Work out facility. There is also walking trails and beautiful Lake Destiny. *** Note: Guests who use the Destiny East Amenities or pools are required to pay $10 per person for the duration of your stay. This lovely home features 4 bedrooms (2 master suites) with 3 full baths and 2 beautiful Half baths. 3229 Square feet of living area. This home is located at near the south gate for a very short walk to the beach. there is a tunnel under the beach road so you don't have to cross the road to get to the beach. The beach access here is very large and is a favorite among locals and our tourists. Enjoy the Crab Trap Restaurant on the beach for great food and drinks. Kids can enjoy the ice cream parlor and big playground on the beach. There is an outside bar for great happy hours and watching the stunning sunsets. Along Scenic Road 98 (the 'Beach Road'), you will find a wide walking/bile path. At any time of the day you can find locals and tourists alike joking, walking or riding bike along the path. You enjoy seeing the beautiful pristine waters and white sands as you travel along the path. This is Paradise found! Sun room with a Sofa sleeper and a 50 LED' TV great for the gamers in the group. Walk out to the back yard with a cobblestone patio area. Grand Dining area seats 8 and there are 5 Beautiful barstools at the breakfast bar. Enjoy the fully equipped kitchen for creating grand meals and entertaining. Enjoy the Flat screen TV in the kitchen as well. There is a powder room on this level. Casual seating overlooking the courtyard below. Master bedroom #1 has a King bed and LED TV. Walk out to the large porch in the back where you can see lake Destiny. Jacuzzi Tub, Custom Tiled shower and 2 walk in closets. Master Bedroom #2 also has a king bed, LED TV and walk out to covered porch. This master bath has a nice size vanity and walk in tiled shower. Bedroom #3 has a Queen Iron bed with an LED TV and walk out to covered porch. There is a Full bathroom with Tub/shower combination. To reach the third floor, you travel up a unique stainless steel staircase. This floor is one room with 2 sets of Double size bunk beds and a half bath. There is also a large sun deck on this level where you can see Lake Destiny. Clubhouse, Pool and Destiny East amenities are available for your use for a $10.00 charge per guest. Please see the clubhouse attendant to purchase a wrist band if you intend to use any of the facilities of Destiny East. Top all of this off with just tons of fun stuff to do all around Destin. Start with the Beaches, of course where you can sunbathe, swim, snorkel, dive, go boating, jet ski, para sail..... and more. Surf fishing is great here as well as our Deep sea fishing. Destin is commonly known as the world's best fishing village. For you golfers, you can play on at least a dozen golf courses nearby. We offer discounts on a couple near by. Fun for the whole family can be found at the Village of Bay town Wharf situated right on the bay with fun stuff for everyone including Zip lining, playground, fine dining, casual dining and great night life. Fun shopping all over this pedestrian area. Every Wednesday night in the summer months you can enjoy live music in the Outdoor concert area (FREE!). Mardi Gras Parade is fun for everyone and check on the numerous festivals year round. Next you might want to visit harbor Walk Village on the Destin Harbor. Stroll up and down this area for tons of fun any time of the year. This area is all along the harbor so you can watch the fishing fleet come in daily and see the catch of the day. Shopping, eating and nightlife are all top notch. So what are you waiting for??? Get on over to Destin to start the fun! We also own "Sunny and Share", book both homes and receive a discount! *** Note: Guests who use the Destiny East Amenities or pools are required to pay $5 per person for the duration of your stay. Staff was helpful each time I had a question or problem. We loved the property and all the space it provided for us to spread out. I really only talked to Cheryl which she was very pleasant to talk to. We enjoyed the house, it was laid and everything about it was lovely. We would love to come back again. Maybe next year. *** Note: Guests who use the Destiny East Amenities or pools are required to pay $10 per person for the duration of your stay.